Sign up for free and just shop with Pop In A Box as normal. 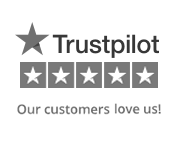 Our average member earns over £300 cashback a year. Pop In A Box cashback can be earned simply by clicking through to the merchant and shopping as normal. Pop In A Box Cashback is available through TopCashback on genuine, tracked transactions completed immediately and wholly online. Pop In A Box offer the best Funko Pop! Vinyl subscription in the UK and is home to all of your favourite characters from films, TV series and video games. If you love everything about Funko and Pop! culture, you might just have trouble deciding what to buy. Their extensive offering features all the Pops! ever made, which are handily divided into various categories to make them easy to find, including new releases. If you take up one of their subscription packages, their unique Pop! collection tracker allows you to let them know which figures you already have and which you are not interested in. This means that they can ensure they will never send you a Pop! which is already in your collection or one which does not fit in with your likes. If you love to save money, you can take advantage of the Pop In A Box referral scheme, which will allow you to earn credit to use when purchasing future Funko Pop! 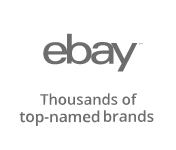 items, while if you join TopCashback via this page, you may find Pop In A Box discount codes and cashback deals. If you want to get your hands on great products every month, Pop In A Box's unique subscriptions will provide you with exactly that. Taking out one of their subscription packages will enable you to build your Pop! collection with a guaranteed mystery Funko Pop! Vinyl which is not in your collection. When you sign up to a subscription, you can be sure that you will never receive Pops! you don't want or any which are already in your collection. This is due to the fact they use an online tracker, which will allow you to list your current collection. You can also create a wish list by logging in to your account and giving a thumbs up or thumbs down to all of the Pops! By thumbing down a Pop! you will add it to your blacklist, which will ensure you never receive it. You can also choose to collect only from certain categories. Through their subscriptions, more than 500 exclusives are given away each month, while as well as being able to receive discounts when buying Pops! from their store, you will also have the chance to get your hands on Chase, Exclusive and other rare Funko Pops! When it comes to deciding on the type of subscription you would like, you can choose to receive one, two, three, six or 12 Pops! per month. If you do decide to take out a subscription, looks for discounts for Pop In A Box on this page to save some money while you shop. 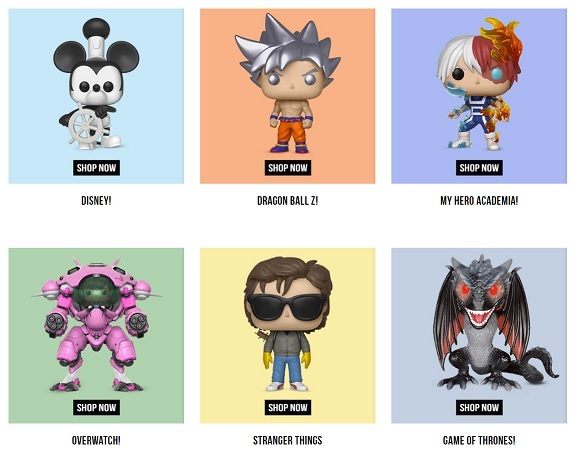 Take a look at the Funko section of the website and you will find different categories of products, which will help you find exactly what you are searching for. The Loungefly range features bags, wallets, pencil cases, backpacks and more which feature great franchises like Pokemon and Nightmare Before Christmas. Pop! Vinyl is home to all of your favourite Pops!, while the Rock candy section includes characters from Game of Thrones, Monster High and Lord of the Rings. You can also search for amazing character mugs from your favourite film or TV series, or grab yourself a new keychain or Pop! pin. If all of that were not enough to keep you entertained, there are Dorbz and Hikari figures, while the Funko sale section will enable you to get your hands on superb products at discounted prices. When shopping with Pop In A Box, you can be sure of finding all of your favourite Funko Pop! Vinyl figures and characters as they have all of the Pops! ever made. From the latest releases to categories ranging from Disney and animation to movies and many more, you can discover the character you have always wanted to get your hands on or buy someone an amazing gift. Pre-order new releases which, if you are a subscriber, you can make savings on, while if you are interested in Pops! which are more rare, you can take a look at their limited edition pieces, as well as characters which are now consigned to the vault. If you have been a collector of Pops! for a while and have not been able to find those exclusives you have been desperately trying to track down, Pop In A Box just might be able to help you out. The Exclusive Pops! section of their website is packed full of some of the greatest figures ever released. You can browse categories such as Pop! Harry Potter, Pop! Marvel, Pop! Star Wars and Pop! Television to find characters like Superman, Martian Manhunter, Harley Quinn, Godzilla and many more. Search by character series such as Beauty and the Beast, Futurama, Lord of the Rings and Power Rangers, while you will discover franchises like The Walking Dead, Street Fighter and Rick and Morty.